Ursa Major to the north and Coma Berenices to the south. It was invented by Johannes Hevelius in 1690. The area of sky it lies in is swathed in many galaxies. 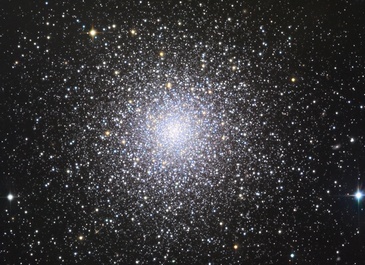 Surprisingly there is also a globular cluster known as M3. Another fantastic aspect of this constellation is that it contains four bright Messier galaxies that are all completely different from one another. These are M51, M63, M94 and M106 and are described below. One of the few objects that isn't extragalactic (outside the Milky Way), M3 is a splendid cluster bursting with hundreds of thousands of gold and blue stars. The core is inordinately condensed and amazingly it comprises half of the cluster! It is relatively young based on the luminosities of its member stars. The multicoloured hues of globular cluster M3 are a great variation from all the galaxies in Canes Venatici. A famous and well known galaxy that has a wide open spiral structure that lends it the name of Whirlpool Galaxy. It is also an astronomical milestone as it was the first deep sky object that was observed to have spiral structure. The spiral structure was first observed in 1845 by Lord Rosse with his 1.8 metre (72 inch) 'Leviathan of Parsonstown' telescope in Ireland. Subsequently he also made a famous drawing of the galaxy as well. Attached to the end of one spiral arm at the northern side of the galaxy is another small galaxy called NGC 5195. 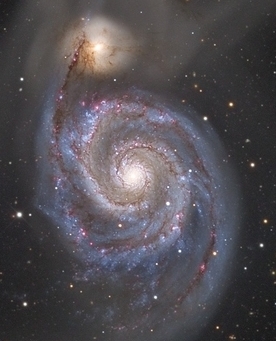 This galaxy is interacting with M51 and a tidal bridge connects the two. The whole group was classed as peculiar by Halton Arp and is also Arp 85. The Whirlpool Galaxy is a marvellous grand design spiral galaxy that is another classic example and another icon of astronomy that people find familiar and beautiful. Despite the name, this spiral galaxy isn't shaped like a sunflower but it has the texture of the core of a sunflower. The texture is created by the bright flocculent spiral arms being criss crossed by dark patches, which gives it a grainy appearance. At the southern edge is a giant dust lane that is probably producing stars. M63 has a very faint outer halo and this only adds to its mystique. The galaxy is in an area populated with dozens of smaller background galaxies. Behind the far right side of the halo is also a tiny edge on spiral galaxy. The 106th entry in French comet hunter Charles Messier's catalogue, this Seyfert galaxy is extremely active. Multiple jets have been observed emanating from the centre. Because of its active nature, M106 has many red blobs of starforming regions. An outer halo is prevalent and this contains a dust lane like M63 except it is thinner and more subtle. The active star formation previously mentioned might be due to M106's elliptical companion NGC 4248, which also has an outer halo. What is discernable when observing this galaxy with a telescope is the ring like structure that it possesses. Less apparent is the fact that it is the brightest galaxy in Canes Venatici at a respectable magnitude of 8.2. The very bright yellow core is encircled by a blue ring of stars, gas and dust. This blue ring is enshrouded by a larger dimmer brownish ring with many yellow giant stars. Starburst and deformed are the attributes of this galaxy that are most prominent. It is interacting with two galaxies, an elliptical companion called NGC 4627 and a more further galaxy affectionately known as the Hockey Stick Galaxy. On the threshold of visibility is a tidal bridge of hydrogen gas between the Whale Galaxy and NGC 4627. An unusual feature present is something known as supershells. These supershells are responsible for pushing dust upwards from the plane of the galaxy. An outer halo surrounds the galaxy and it was formed from outflows of material that was expelled from the core by the kinetic energy and winds from giant stars. Because of its extraordinary attributes, it is also catalogued as Arp 281. This galaxy is unmistakably shaped like a hockey stick and above it is a connected knot called NGC 4657 that could possibly be considered to represent a ball. The reason behind the unusual shape is gravitational interaction with the nearby Whale Galaxy. These two galaxies have deformed each other through gravitational interaction and currently they are speeding away from each other. The Cocoon Galaxy is akin to a cocoon containing many starforming nebulae that seem to lace parts of the edge. The nebulae are also on the parts of both galaxies that face each other as a result of the aforementioned interaction. Since this galaxy isn't exactly normal, it also has the designation of Arp 269. 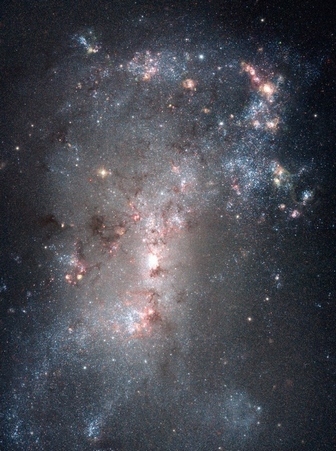 A dwarf galaxy that is going through an explosive episode of star formation. This means that this galaxy is starburst. What is causing the starburst behaviour is not definite, either an interaction or a merger. Previously this galaxy might have been a barred spiral galaxy as there are slight hints of a bar in the central regions. A truly spectacular image of NGC 4449 that shows the galaxy's fireworks in unprecedented detail. A supershell can clearly be seen in the upper right with clusters between the HII regions. NGC 7331 in Pegasus and the arms are featureless save for some odd splatterings of HII regions. The core contrastingly is very detailed with a multi tiered structure and a dust lane at the south of the core region. Heron Galaxy. They are also classed as Arp 84 because of their interaction. NGC 5395 is the largest of the pair and its largest spiral arm instead of curving normally around the core, it is elongated and the galaxy NGC 5394 is attached to the end. A tight grouping of five galaxies, this is one of the more accessible of the Hickson groups. There are three elliptical galaxies and a face on and edge on galaxy. The brightest at magnitude 11 is the largest elliptical, NGC 5353. This can be seen in medium sized telescopes. The largest member of the group and the second brightest is the face on spiral, NGC 5350. It appears to be a ringed barred spiral. The other three galaxies require a large telescope to be glimpsed. The whole group is located near the large spiral galaxy NGC 5371.